Uuni Pro is like a gift that keeps giving especially to all the Pizza Lovers. If you have not yet heard about the Uuni Pizza makers then you have to read about the Uuni 3 Pizza Oven which is pretty amazing. Unni Pro is an upgraded version of the Uuni 3 pizza oven. In this newer version, you have a quad fuel system which means you can use wood, pellets, charcoal or gas. 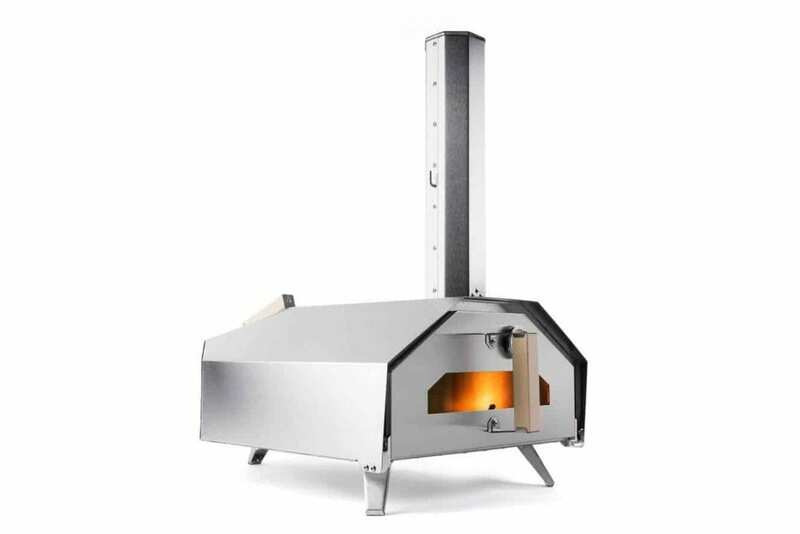 This way you can use this pizza oven as you like and if you want a wood-fired pizza oven flavor then you can use wood pellets inside the Unni Pro or if you have the charcoal flavor then all you need to do is change the fuel. Unni Pro has retained the amazing features of its predecessor and cooks pizzas amazingly well. The pizza oven heats up quick and retains the heat really well so that you can cook pizzas evenly. Well, the Uuni 3 needed a pellet burner as you had to use wood pellets with them but since Uuni Pro is versatile when it comes to the source of the fuel, you can use charcoal pieces or even burn wood. 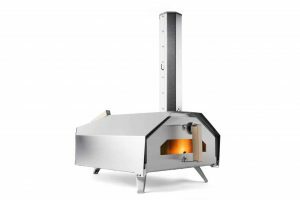 You need to buy the pellet burner separately so if you do not want to invest in that then you can easily use wood or other sources of fuel to get started with this pizza oven. The Uuni Pro has an amazing letterbox style door which makes it really easy to slide the pizzas in and out. You need to buy a pizza peel separately and dusting it with flour should help you cook pizza easily inside this pizza oven. The oven comes with a Wood + Charcoal Burner as standard and you can get started with charcoal as the baseline in order to reach the required temperature. Once the charcoal bits are heated up, you can throw in a few wood pieces in order to get the smoky flavor. You can also get a pellet burner where you would be using wood pellets as the fuel. I guess it would be faster to get the oven heated up with the pellets as they are way more energy efficient. Overall, the time taken to start the oven would be around 15- 20 minutes which is pretty decent. Honestly, both the charcoal and the wood pellets take the same amount of time, so choose your fuel according to the availability. 1. The Unni Pro is really easy to set up and it would take you around 15 minutes to set up the whole pizza oven. The Unni Pro is like the Uuni 3 easy to set up and use. It comes with an instruction manual so once you go through the manual you would be able to easily set up the entire pizza oven within no time. 2. The door of the pizza oven helps keep uniform heat inside the chamber while you are cooking the pizza which ensures that the pizza is cooked evenly and perfectly. The letter box opening style of door in this pizza oven makes it really easy to slide the pizzas inside and out. There are typically two doors, you can use the other door to measure the temperature inside the oven. 3. Once the oven has reached the optimal temperature, you can cook pizza is just 60 second which is pretty amazing and fast. This is something that is pretty impressive about the Uuni Pro oven. 4. It is a quad fuel pizza oven so you are not limited to using wood pellets as in the case of the Uuni 3. You can use wood pellets, wood, charcoal or even gas. This gives you an option to choose if you want the amok wood flavor or the charcoal flavor in your pizza. Honestly, this is better than Uuni 3 as you have an option of choosing the type of fuel you want to use with the pizza oven. 5. The Pizza oven is a little larger than the Uuni 3 but you can carry it around easily. The oven is portable making it perfect for camping trips. 2. The Unni Pro is slightly expensive in comparison to the Uuni 3 and it comes with a default Charcoal+ Wood burner. If you plan on using wood pellets then you might want to get the wood pellet burner. 3. It does not come with a Pizza Peel, so if you do not have one, you might want to get it separately. Who is the Unni Pro Pizza Oven for? 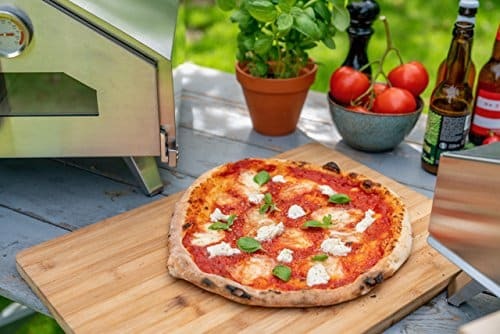 This pizza oven is amazing if you want to cook a couple of pizzas in just 10 minutes or you want to cook a couple of pizzas real quick. It is perfect for pizza enthusiasts, organizing family get-togethers and small parties. The pizza oven will give you the perfect wood oven pizza flavor making your pizza look professional and taste authentic. You can even take it with you on a trip or camping. It is perfect for cooking outdoors while camping, all you need is the oven and the ingredients for making a pizza. Uuni Pro is one of the best pizza ovens that you could get for your backyard. With almost every feature perfectly crafted, this oven is going to be one of the best investments that you would make if you love eating and making homemade pizzas. This pizza oven can easily make pizzas within 60 seconds which is pretty fast. The pizza cooks well provided you keep turning the pizza every 15-20 seconds and the entire oven can be powered by high-density wood pellets, wood, charcoal or even gas. The Uuni Pro is definitely an upgrade from its previous versions and if you want an amazing pizza oven that can help you cook multiple pizzas within a few minutes then you might want to try this oven. 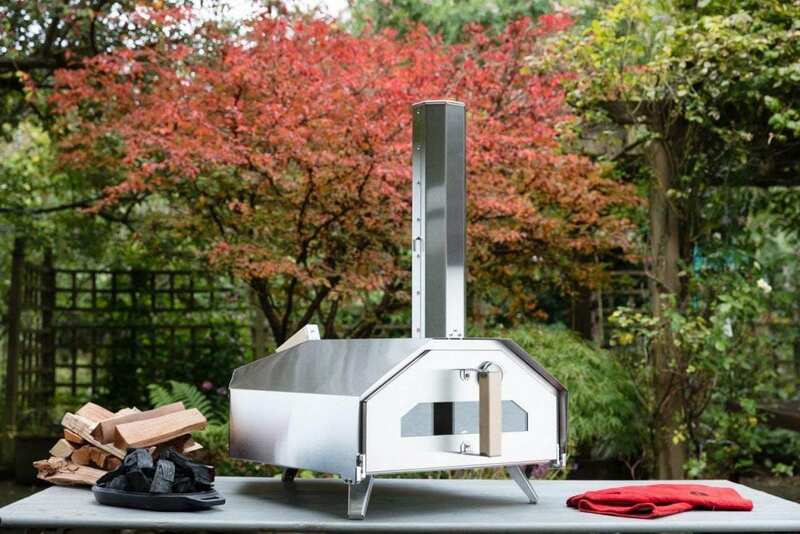 If you have had any experiences with this Pizza Oven then let us know in the comments section below!